How it works: The Falcon is a soil-sampling machine that collects, logs and stores soil samples on the go using a ground-driven drum and probe assembly pulled on a trailer. After soil cores are collected, the Falcon mixes the sample, fills the container and indexes the sample at the push of a button. Samples are stored on back of the trailer. North Carolina farmer Allan Baucom attracted attention at farm shows last year when he unveiled an automated soil sampling machine called the Falcon, which took soil samples on the go as it was pulled down the field. In August at the 2015 Midwest Ag Industries Expo, Baucom unveiled two models that automate the process even further and replace the old method of pulling samples by hand. 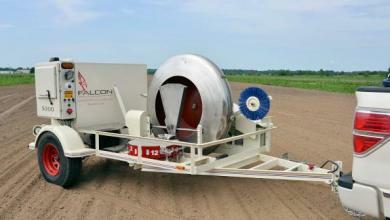 Like the original Falcon, the new Model 1000 and Model 5000 take soil samples with a probe attached to a 5-foot-diameter drum mounted on a trailer. A sample is collected every 15 feet, which is one revolution of the wheel. The soil is mixed inside the wheel, and each sample is funneled into its own container, which can be sent to a soil lab for analysis. Last year’s unit didn’t have an integrated GPS system, so to track the exact location of each sample, you’d have to do it manually. This year, Model 5000 has GPS built in so when the machine takes the sample, it gets a barcode with the location, which can be downloaded to a computer. Cloud-based data integration with soil test laboratories and precision ag software is in prelaunch testing. 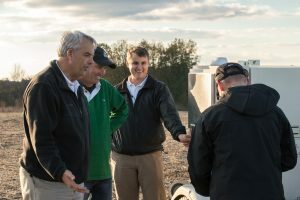 “While based on a simple wheel, the Falcon incorporates GPS, a modern computer interface and cloud communications technology for streamlined operation and data management needed for precision agriculture,” Baucom says. Other improvements include an upgraded video camera for remote machine viewing, LED work lights, and an enhanced power package that includes a charger and external PC ports. The Falcon can be pulled by a truck, tractor or utility vehicle. The difference between the two new models for this year, Model 1000 and Model 5000, is in the feature package offered. Suggested list price for the Falcon 1000 is $49,870, and for the Falcon 5000, it’s $58,850.